An NYPD Officer has been suspended without pay after he was found guilty of lying in an attempt to cover up a false arrest. The 10-year veteran of the NYPD now faces a potential prison sentence of up to four years when he is sentenced by the Judge next month. The incident in question took place in 2012, when New York Times photographer Robert Stolarik was taking pictures of NYPD officers making an arrest in the Bronx. Officer Michael Ackerman claimed that Mr. Stolarik interfered in the arrest by repeatedly discharging the flash of his camera in the officer’s face. As a result, Mr. Stolarik was falsely arrested for obstruction of governmental administration. However, it later transpired that not only did Mr. Stolarik’s camera not have a flash, but Mr. Stolarik did not even own a flash. In light of this, all of the false charges against Mr. Stolarik were dropped and prosecutors instead focused their attention on Officer Ackerman, who was charged with falsifying an official record. Officer Ackerman claimed in his trial that he had made an honest mistake, but he was nonetheless found guilty of lying to cover up the false arrest. Officer Ackerman has been suspended from the NYPD and faces a possible prison sentence of up to four years. 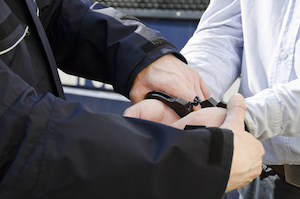 If you have been falsely arrested or maliciously prosecuted as a result of an officer’s false statement, or you have been the victim of excessive force or any form of police misconduct, then you should contact the attorneys at PetersonDelleCave LLP.